Cowley College employees Joe Clasen and Stephani Johns-Hines were the recipients of Leadership in the Field Awards at the Kansas Council for Workforce Education (KCWE) fall conference November 6 at Butler Community College in El Dorado, KS. Clasen, Career and Technical Education Department Chair, developed the first ever Non-Destructive Testing courses to be reviewed and approved by Quality Matters, an organization devoted to excellence in online instruction. The program is the only Associates' in NDT program nationally certified for online delivery. According to Dr. Harold Arnett, Cowley College vice president of academic affairs, Clasen has been instrumental in helping to develop a new program for milling students involved with the International Association of Millers (IAOM). Clasen also frequently hosts visiting students and teachers to the Cowley College campus and is currently involved in cultivating new partnerships with area business and industry. “He takes an obvious interest in students and delights in their success,” Dr. Arnett said. Johns-Hines, associate vice president for Mulvane and online operations, worked to develop a Navy partnership with the school’s online NDT program, providing highly qualified NDT graduates for Naval bases in a significantly shorter time-frame than the internal Navy training. She also promoted/supported the first ever NDT courses to be reviewed and approved by Quality Matters and assisted in the creation of partnership with IAOM and local mills, overseeing the creation of online curriculum to meet national industry needs. Johns-Hines helped garner Cowley College the status of first institution in Kansas to achieve state authorization in 50 states and three territories, and represents Cowley College on three area Chambers to promote career and technical training. “This award is very much appreciated. This recognition is really a culmination of a much larger group of efforts,” Johns-Hines said. Dr. Arnett said the College is fortunate to have a program of this quality at Cowley College thanks to the efforts of people like Joe and Stephani. 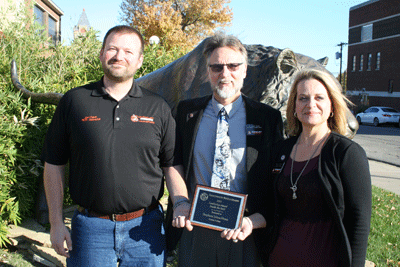 “I am glad to recognize the ability and efforts of people we are blessed to have here at Cowley,” Dr. Arnett said.